Long before Columbus, the islands of the Caribbean were home to Native American peoples. Over thousands of years, these island inhabitants built rich and diverse cultures, with their own technology, diet, history, religion, and art. Sadly, these people all but disappeared in less than a generation after their first contact with Europeans. They are known today as Lucayan [Tainos]: an anglicized version of the Spanish ‘Lucayos,’ which derives from the Arawakan words Lukkunu Kaíri (‘island men’). The Lucayans share a common ancestry with the Taino societies of Puerto Rico, Haiti, Dominican Republic, Cuba and Jamaica (the Greater Antilles), who they separated from around A.D. 600 when they began to colonize the Turks and Caicos and the Bahamas (hereafter called the Lucayan Islands). By 1492, they had settled all of the larger Lucayan Islands. In addition, they continued to exchange goods with other Tainos living in the Greater Antilles. To date, most of what has been written about the Tainos has drawn upon the written record left by the Spanish. However, because the chronicles were written to serve political objectives, be they for or against the native peoples, and because the chroniclers themselves were limited in their abilities to understand a non-western culture, these documents are rife with errors and misinformation. The uncritical use of the historical record has hampered efforts to understand native West Indian societies. For although we continue to speak of Tainos as a single unified group, there were regional differences in language and culture, if not also in race. One need look only to the Soviet Union or the former Yugoslavia to be reminded of the fragility of national identities. The present paper draws on the last two decades of anthropological scholarship to present a brief chronicle of the development and extinction of Lucayan Taino culture. The origins of the Tainos are traced to the banks of the Orinoco River in Venezuela. As early as 2100 B.C. villages of horticulturalists who used pottery vessels to cook their food had been established along the Middle Orinoco. During the ensuing two millennia their population increased in numbers and they expanded down river and outward along the Orinoco’s tributaries to the coasts of Venezuela, the Guianas, and Trinidad. Their movements are easily traced because the pottery they manufactured is so distinctive. 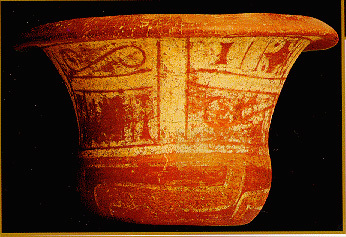 Called Saladoid after the archaeological site of Saladero, Venezuela, their vessels were decorated with white-on-red painted, modeled and incised, and crosshatched decorations. White-on-red painted Saladoid bowl from Guadeloupe, circa AD 300-600. Saladoid peoples expanded through the Antilles at a rapid pace. Because their earliest settlements, which date before 400 B.C., are in the Leeward Islands, Virgin Islands, and Puerto Rico, the inescapable conclusion is that most of the Lesser Antilles were leapfrogged in a direct jump from Venezuela/Trinidad to Puerto Rico and its neighbors. Moreover, the conditions which stimulated the initial migration into the Antilles continued to fuel dispersal from South America bringing a variety of related ethnic groups into the Antilles over the next millennium. Saladoid peoples lived in small villages and practiced swidden agriculture in which a variety of different crops were cultivated in small gardens; a practice very similar to present day “casual cultivation.” Due to the limited fertility of the soil gardens were cultivated for only a few years before new gardens had to be cleared. Frequent movement of village sites is evident from the absence of deeply stratified sites. A number of the early sites are located inland on watercourses adjacent to prime agricultural land, but most Saladoid sites are in coastal settings. In both settings, horticulture was the primary source of food. At the inland sites land-crab remains are the main component, while at coastal villages the shells of marine mollusks and bones of marine fishes were also important. 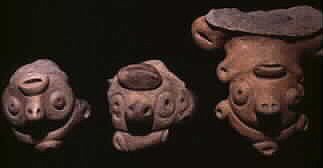 Animal faces adorned the sides and rims of many Saladoid pots. For some reason the Saladoid advance stalled after they had colonized eastern Hispaniola. Irving Rouse has suggested that a large and well-established population of hunter-gatherers barred their forward progress, and that the Saladoid population needed time to grow and refine their adaptation to island life before the frontier was breached. Some of the resident foragers may have been assimilated before further expansion took place. The next phase of cultural development is announced by a marked change in material culture. 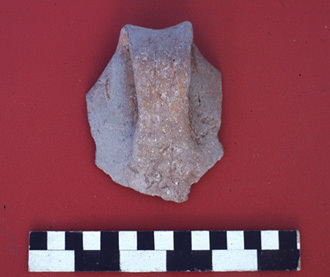 The previously elaborate pottery decorations disappear, especially along the frontier where most of the pottery was undecorated with only red slip and the simplest modeling retained from the Saladoid series. These simplified designs have been classified as comprising the Ostionoid series, named for the type site of Ostiones in western Puerto Rico. By A.D. 600 the Ostionoid peoples had resumed the advance of their Saladoid ancestors and had begun to expand along both coasts. Expansion along the southern coast of Hispaniola led to the colonization of Jamaica, while movement through the northern valleys led to the colonization of eastern Cuba, the Bahamas, and the Turks and Caicos. Given their modern barren landscapes it is often asked why anyone would leave the fertile valleys of the Greater Antilles to live in the Lucayan Islands. The answer is that although the Lucayan Islands are today covered by low scrub vegetation and there is a noticeable lack of fresh water, these conditions did not prevail 500 years ago. In fact, the Lucayan Islands would have been quite attractive to small groups of horticulturalist who farmed the loamy soils and relied on the sea for fish and transport. Spanish records indicate that the Lucayans cultivated as many as 50 different plants, including varieties of sweet and bitter manioc, sweet potatoes, cocoyams, beans, gourds, chili peppers, corn, cotton, tobacco, bixa, genip, groundnuts, guava, and papaya. The carbonized remains of corn, chili peppers, palm fruits, unidentified tubers (probably manioc and sweet potato), and a gourd (from Middle Caicos) are among the plant remains identified in West Indian sites. At least 50% of the Lucayan diet came from plant foods. Manioc (cassava) was the staple, followed by sweet potato. Corn was apparently of little importance. 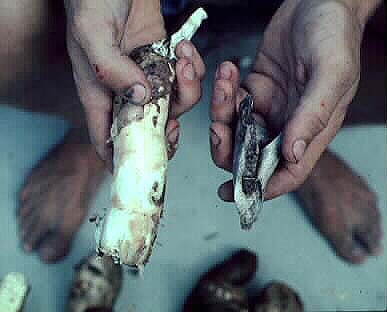 Manioc tubers require special processing because they contain poisonous hydrocyanic acid. Sweet manioc has such small quantities of the poison it can be prepared like sweet potato — peeled and boiled. Bitter manioc, however, requires a more elaborate procedure which involves peeling, grinding or mashing, and squeezing the mash in a basket tube to remove the poisonous juices. After the juice is removed the paste is either dried and sieved for use as a flour or toasted into farina (a principal ingredient of tapioca). Water is added to the flour to make pancake-like cassava bread which is cooked on a flat clay griddle. The poisonous manioc juice is not discarded. It is boiled to release the poison and then used as the liquid base for casiripe, “pepper pot” stew. Pepper pot is made by adding chili peppers, other vegetables, meat and fish to the simmering manioc juice. In this way foods that would otherwise spoil can be preserved for future meals. The slowing simmering pot is available for meals throughout the day. Today in South America, pepper pot is eaten with cassava bread. Fragments of large ceramic bowls and griddles, made from red loam and burned and crushed conch shell, are common in archaeological sites. 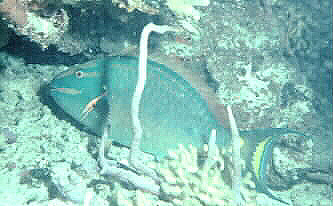 Parrotfish are the most common fish in archaeological sites. The other half of the diet came from land animals and the sea. The few land animals that were available (iguana, crabs, and a cat-size rodent called hutia) were highly prized, but were available in limited quantities. The major source of animal protein came from the coastal marine environment. Marine turtles and monk seals were available seasonally, but the main foods were the fishes and mollusks who feed in the grass flat/patch reef habitats between the barrier coral reef and the beach: parrotfish, grouper, snapper, bonefish, queen conch, urchins, nerites, chitons, and clams. Fish were captured with nets, basket traps, spears, bow-and-arrow, and weirs. The latter involved building check-dams across the mouths of tidal creeks which allowed fishes to enter at high tide but prevented their escape when the tide changed. Meat and fish were barbecued (a Taino word) on a grill, with leftovers added to the pepper pot. When you consider the number of ways a Lucayan could satisfy their hunger, the islands are noteworthy for the abundance of options. It is difficult to imagine that anyone ever went hungry; a conclusion confirmed by the preliminary examination of human skeletal remains which indicate that the Lucayans enjoyed remarkably good health and nutrition. They certainly did not suffer from the nutritional and diet-related disorders that plagued other horticulturalists in the West Indies and elsewhere. 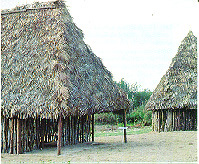 The Tainos lived in large multi-family houses. In Hispaniola there were two kinds of houses: the rectangular caney, and the round-to-oval bohio which had a high-pitched, conical thatched roof. Although probably an exaggeration, Bartolome de las Casas reported that some houses were occupied by 40 to 60 heads of household (roughly 250 men, women, and children). Households were formed around a group of related females. Grandmother, mother, sisters, and daughters lived together and cooperated in farming, childrearing, food preparation, and craft production. Men, by virtue of their absence from communities during periods of long-distance trade and/or warfare, were peripheral to the household. The importance of females as the foundation of society was expressed by tracing descent through the female line to a mythical female ancestress. The household’s belongings were stored on the floors and in the rafters of the houses. Cotton hammocks for sleeping were strung between the central supports and eaves. Excavations of a house floor on Middle Caicos revealed ash deposits which may have come from small, smoky fires used to control insect pests and to warm the house at night. Cooking was probably done in sheds outside the main house. 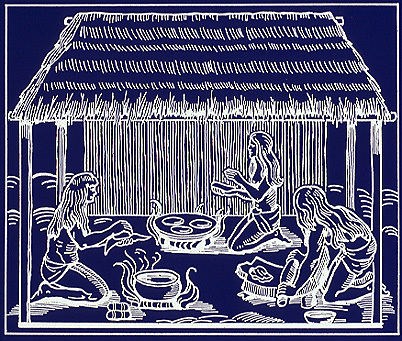 Lucayan women cooking, according to Benzoni, 1571. Most villages in the Lucayan Islands were composed of houses aligned atop a sand dune with the ocean in front and a marshy area behind. Quite likely, these marshy areas provided ready access to fresh water before the islands were deforested. In addition many sites are located just offshore on small cays, such as Iguana Cay in Jacksonville Harbour, East Caicos. 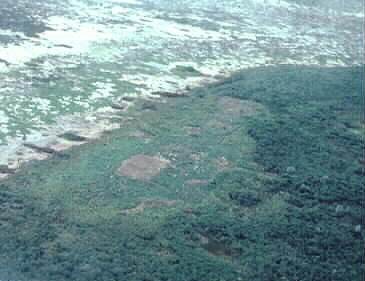 Lucayan sites occur in pairs, which reflects either cooperation between socially allied communities or sequential settlements in the same location. The former possibility is more likely because it is the men who most often were the leaders, even in matrililineages, and especially with regard to external relations. In a matrilineal society, your mother’s brother, and not your father, is the most important male in your life because he heads your family’s lineage. However, if men are needed by their matrilineage, yet are expected to live in their wife’s village, then social relations will be unstable. These competing demands can be balanced by establishing villages in close proximity, thus reducing the distances that men must travel to participate in their lineage affairs. Archaeological site on Middle Caicos with two-plaza plan. At the center of Plaza 1 is a court which has stones aligned to track the summer solstice and other astronomical events. In the Turks and Caicos and the Greater Antilles a slightly different type of community plan predominates. Here the houses are arranged around central plazas. The plazas were used for public displays, ritual dances, recording astronomical events, and for the Taino version of the ball game. The house of the cacique (“chief”) is usually located at one end of the plaza, and within the cacique’s house are stored the village idols and spirit representations called cemís. This community plan shows a heightened solidarity among its members reflecting the social hierarchy and competition between cacicazgos (chiefdoms). The Taino pantheon of spirits, called cemís, was divided according to the dichotomies of gender and cultural/noncultural. There were principal male and female spirits of fruitfulness, Yucahu, the giver of manioc, and Attabeira, the mother goddess. They both attended by twin spirits. The anti-cultural world was ruled by Maquetaurie Guyaba, Lord of the Dead, and Guabancex, Mistress of the hurricane. They too were attended by sets of twins. Cemís played an active role in the affairs of humans, and they served to distinguish between that which was human, cultural and pleasing; and that which was non-human, anti-cultural, and foul. But as exemplified in the twins, the Tainos recognized that the spirits of the world could simultaneously have positive and negative characteristics. Rains are good when they arrive at the right time and in the right quantity, but they can devastate agricultural lands when the timing is wrong or too much rain falls. The world is in a delicate balance, and the spirits must be attended to to maintain this balance. The chief male diety, Yocahu, "the giver of manioc." Petroglyph of the chief female diety Atttabeira, the fertility goddess. Her image is carved on a large stone in the main ball court of Caguana, Puerto Rico. By the time Europeans arrived, Taino society had two main divisions. The rulers of the community were nitainos (nobles) which included caciques, behiques (healer or shaman), and other elites who held positions of authority. Caciques ruled at several levels from the paramount caciques who ruled large regions, to district leaders who were allied to a paramount, to headmen and clanlords who ruled at the village level. It should be noted that women were also sometimes chiefs. Noble birth was the main prerequisite of this rank. Alliances were formed between caciques at all levels through arranged marriages. 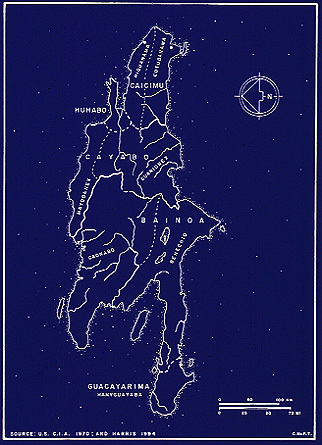 Map of the major Taino provinces on Hispaniola.The island is shown with east at the top to reflect the Taino belief that the sun rose at the top of the world. The names of the principal caciques who ruled in these territories are given in the smaller font (Source: Peter O’B. Harris, personal communication). Supporting the rulers were large numbers of commoners. Blood and marriage (kinship) are the threads that bound commoners to caciques. There was also a level below the commoner class which the Spanish described as a class of servants called naborias. Naborias were once thought to be slaves, but a careful reading of the chronicles indicates that they served through a sense of obligation and were not chattel. Caciques organized villages into regional polities who competed with each other for a variety of resources. 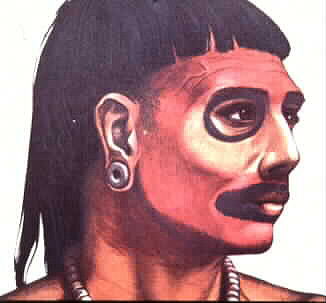 There is increasing evidence that contrary to the “peaceful Arawak” stereotype, the Taino Cacicazgos made war on each other prior to the arrival of the Spanish. Caciques also organized long-distance trade. Travel between islands was accomplished in canoes dug out of a single log. The largest canoes (also a Taino word) could carry 100 passengers. Traders sought both domestic (salt, dried fish and conch) and exotic materials from other cacicazgos and from neighboring islands. The Chama shell disc beads that were manufactured on Grand Turk are an example of an exotic good. These beads were woven into belts that served to record alliances between cacicazgos. These and other exotic materials served to reinforce the authority of the caciques to whom access to these goods was restricted. By one account, Taino caciques held authority of life or death over their subjects. When Columbus set foot on the island he called San Salvador, he was met by young men carrying spears who were there to defend their village. Other encounters between the Spanish and Tainos also point to the importance of warfare in Taino society. For instance, when Columbus embarked on the conquest of central Hispaniola in 1494 he was challenged by an army of up to 15,000 warriors (although this may have been an exaggeration). Moreover, shortly after the Spanish arrested Caonabo, the cacique of Maguana, Bartholomew Columbus was passing along the Neiba River which formed the boundary between Xaragua and Maguana. Here he encountered an army from Xaragua which was probably in the area to co-opt villages that had previously been allied with to deposed Chief Caonabo. Taino social organization also points to the presence of an organized and well-armed militia. Within a generation of the arrival of the Spanish, the native peoples of the Lucayan Islands were extinct. In 1513, Juan Ponce de Leon sailed through the Lucayan Islands on his way to Florida. He encountered only one old native man in the Turks and Caicos Islands. Other expeditions followed, including two in 1520 which failed to encounter any native peoples in these islands. The fate of the Lucayans can be traced to the mines on Hispaniola and pearl beds of Cubagua Island off the coast of Venezuela. By 1509, the Spanish Governor of Santo Domingo had convinced King Ferdinand that there was a critical shortage of labor on Hispaniola. 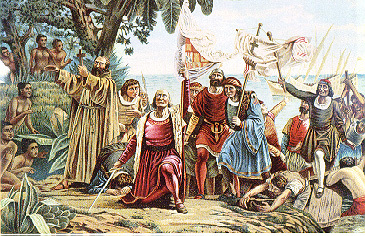 In response the king ordered the removal of all peoples from the neighboring islands to Hispaniola. A slaving consortium was soon formed in Concepcion de la Vega, although documents in the archives in Seville suggest that the practice of enslaving Lucayans had begun much earlier. Peter Martyr reported that 40,000 Lucayans were brought to Hispaniola. The total population of the islands was probably twice that number when children, old people, and others who died are included. A total population of 40,000 to 80,000 Lucayans is consistent with archaeological deposits in these islands. When Columbus set foot on Guanahaní he was met by people whose simple dress and material technology belied their social and political complexity. Theirs was a vibrant culture in the process of filling up the northern and western Lucayan islands at the same time they were competing amongst themselves for political and economic control of the central islands. Moreover, had the Spanish never arrived the Lucayans might soon have been subject to demands from the Classic Tainos on Hispaniola who were already establishing bases in the Turks and Caicos and Great Inagua by the middle of the 13th century. Instead, they are remembered as the first to challenge Columbus and the first to be extinguished. This article was originally written for Times of the Islands: The International Magazine of the Turks and Caicos. It was published in the Summer 1996 issue and is reprinted here with their kind permission. Although the article uses the Turks and Caicos and Bahamas as its starting point, much of the information is relevant to all of the Native Peoples of the West Indies.